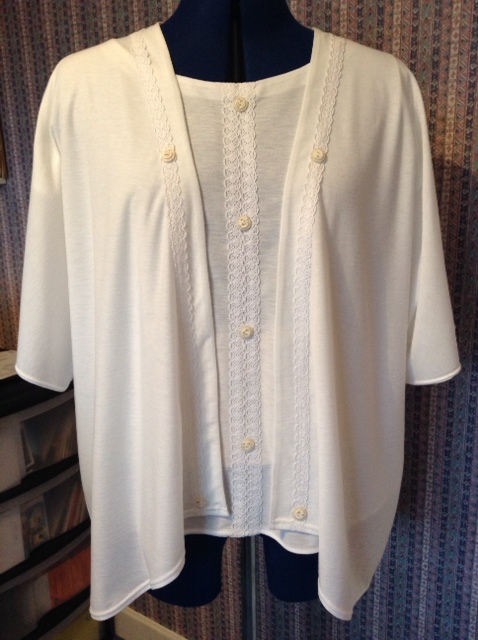 I was in danger of not blogging anything in February, but after not sewing for about 6 weeks, I have my newly serviced machine back, and have just finished a white jersey T-shirt and cardi, from the New Look pattern that was free with last month’s Sew magazine. I’ve seen a few blogs where people have got tired of winter sewing and started summer sewing, and despite having just returned from summer in Australia, I too have been summer sewing. I mainly did it because I wanted to sew something quick and easy before I return to re-make the Ultimate Trousers (see last post), and I decided on white because in principle white goes with anything, as I noted when I was travelling with a limited wardrobe. This outfit can also be either smart or casual, which is also a useful feature. The jersey is from Fancy Silk Store and the embellishments from Guthrie Ghani. Unfortunately there was a hole about 70cm into the fabric and I had a bit of a job cutting round it, but I decided that cutting round it was easier than taking it back, and did manage to get everything cut out whilst avoiding the hole. There was lots of measuring going on to try to get folds on the straight grain. If I missed the grain, its not all that noticeable. I am not one for totally plain clothing, and the embellishments grew somewhat as the garment construction progressed. 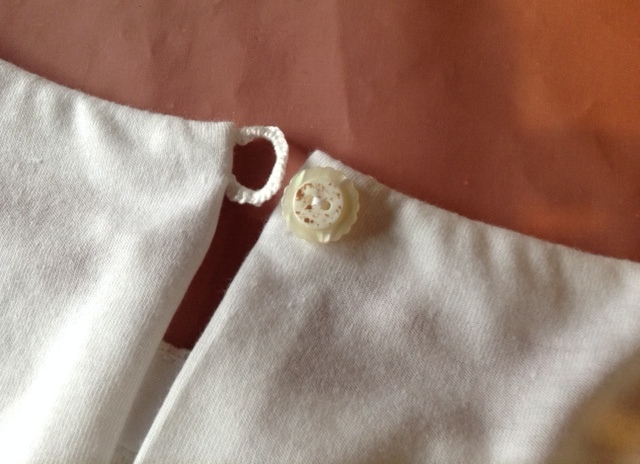 There are two lengths of white lace down the centre front, with intermediate shell buttons. The same button is used in the back fastening. Having forgotten to interface the cardi facing, but concluding that this was probably a good thing, as I cannot think of any jersey clothing that I have interfaced, I pondered how I might prevent the facing rolling into places where it shouldn’t be. Sort of obvious, but add more lace and sew it so that it catches in the edge of the facing! This allows the jersey to still drape nicely, whilst absolutely preventing the facing from rolling! And add a few more buttons so that I have a matching set. I also pondered the back fastening. Firstly, having made the t-shirt in jersey, it probably doesn’t need one, but I followed the pattern and finished the neck with bias binding. The pattern also asked for a bound loop, which I haven’t done for years, and had no suitable white thread. 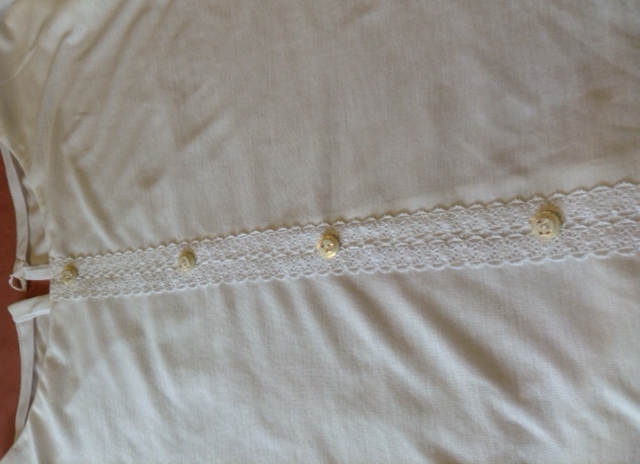 I attempted a rouleaux loop from some white satin binding that I had, but it was going to look messy when attached, so I re-thought, and eventually went out and purchased some white embroidery thread. And I am pleased with the results. There may be more such loops in future. I suspect that the neck is big enough that I will never need to unfasten it. I will have to wait a few more weeks to find out I think. This entry was posted on February 25, 2015 by ann hebden in Blouses, Fashion, Jackets, Sewing, Tops and tagged Fashion, Handmade, Jacket, knits, Sewing, t-shirts, Tops.